William Barry, Jr. photograph taken in October 1921. Location is unknown. From the Railfan.net ‘erielack’ E-Mail List Photo Archive, negative X2189. One of a recent batch of photos on the Railfan.net ‘erielack’ E-Mail List Photo Archive caught my eye as it featured a string of Pennsy hoppers. 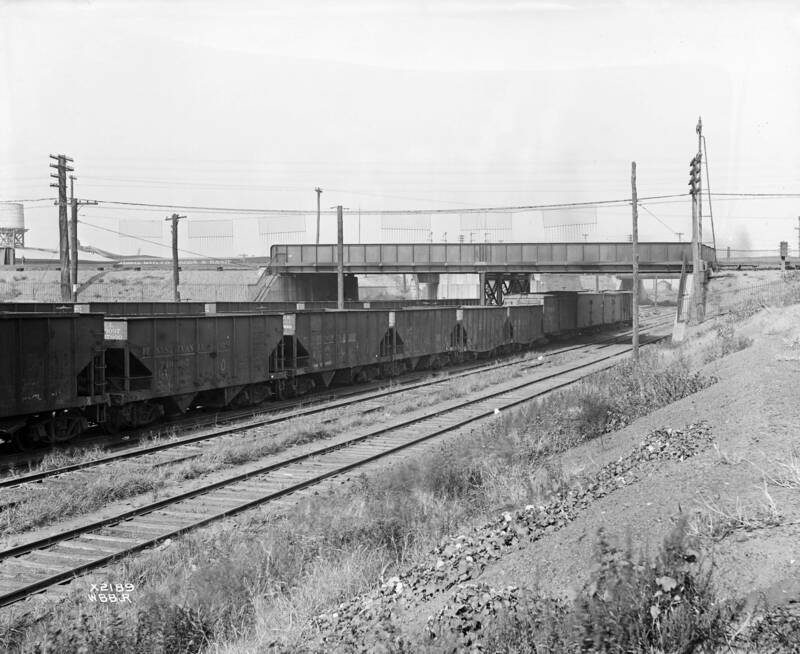 As per a Bob Bahrs comment on the related discussion list, this image was taken at the Jersey City-Lackawanna overhead crossing of PRR, Erie, and NYS&W tracks between Marion and Croxton at West End. Click on the image above to review a larger size. I enjoy reviewing the latest uploads to this site while enjoying my morning coffee. I like to zoom in and look around for other neat stuff in the margins. But with this image, there are plenty details to note on each freight car. Let’s break down the image and summarize a few cars at a time. The image above is a crop of the main image. Levels have been adjusted to check out the details. The area around the truck on the first car has been dodged a bit to bring it out of the shadows. So, what are we looking at? These are a couple of well weathered hopper cars. While the car on the left is only a partial view, it is taller than the next one. It has a reinforcing angle along the top chord and the detail to the left of the truck looks like it could be part of a clamshell type hopper door. This car could be one of the Pennsylvania Railroad’s (PRR) H21 class hoppers. 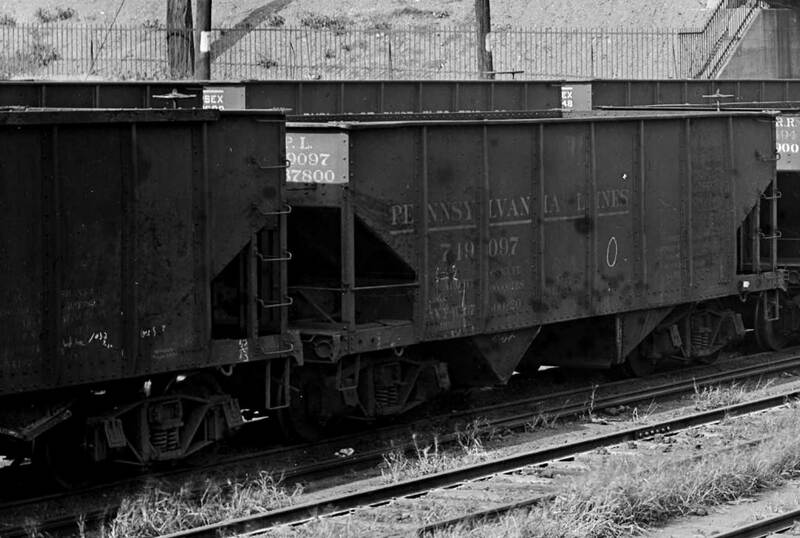 The car design was introduced in 1909 as a coke hauler but by the 1921 photo date many were hauling coal. The steel panels are quite weathered and possibly rusty, obliterating whatever lettering that was applied here. The car doesn’t seem as weathered as the other, but there are odd dark splotches and streaks to note. Both cars bear chalk marks and are riding on arch bar trucks. The next two cars are also PRR GLa class hoppers. The GLa car design was introduced in 1904 and the PRR built thousands for coal service. The first car is a Lines West car and the LINES lettering has been painted out on the car side. The car has a fresh reweigh stencil on the end to go with the new stencil on the car side. This car was recently reweighed as there is a fresh stencil along the sill noting the location, light weight, and date. Check out the steel patch plate above the roadname. That’s something to add to an occasional weary hopper. The next car shows a fair amount of weathering and another painted over area above the far truck. Very little lettering can be seen on these two cars. Both cars also have route cards attached. These cards are the light color squares at the lower right end of these cars. One can also be seen at the far left side of the image on the previous car. As we look deeper into the original image, it becomes more difficult to see details. The next two hoppers are members of the distinctive PRR GL class. The fish belly side sill is a key spotting feature and both cars seem to be lettered for the PRR. The GL class was the first all-steel coal hopper on the PRR and came into service in 1900. Thousands were built over the next few years. On these cars, paint failures on rusty patches seem to be common. Each car has a route card attached, but the board for these cards is mounted in a different location than what we saw on the GLa cars. Beyond the string of hoppers are a few house cars. 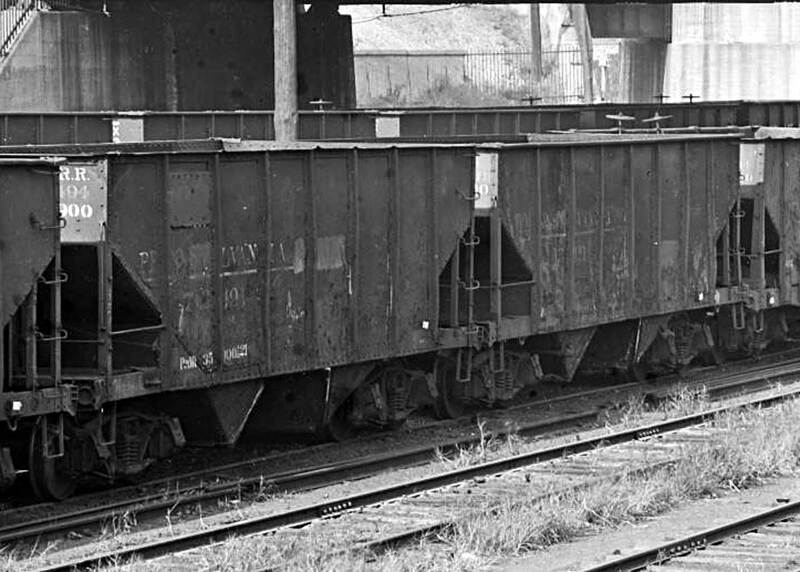 The first one could be a Seaboard double-sheathed box car with a fish belly side sill. A couple of refrigerator cars follow; one of them has a noticeable sag in the middle of the car and may need repair. Our hobby has long promoted this sagging look on older rolling stock but it was not very common on the prototype. This is one of the few examples I’ve seen. 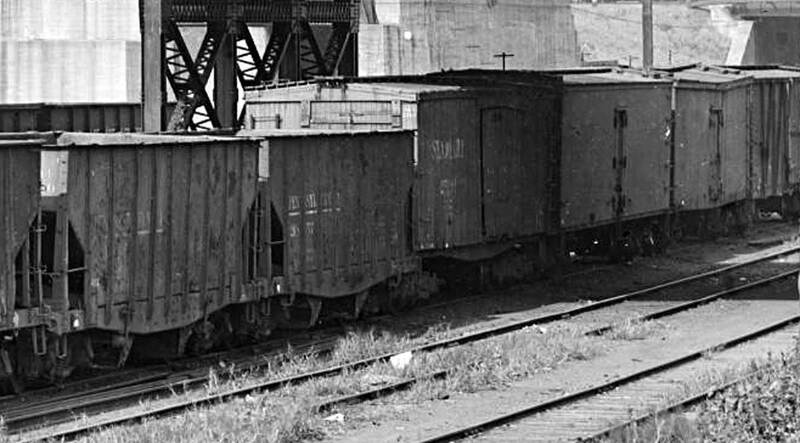 Beyond the refrigerator cars is a single-sheathed box car, possibly of the Dominion/Fowler type design. Here’s is a partial look at my hopper fleet. The Wheeling Freight Terminal uses a few hoppers for coal so most of my models need detail work and weathering for future service. The historic Lackawanna prototype image will be one of the guides I use along the way. Here’s a link to the full size image file. Download a copy to use with additional prototype images for your future hopper upgrades. Thanks for dropping by and reading the blog. Share a comment in the section below. Please follow the instructions so your comment can be posted. All comments are reviewed and approved before they appear. To subscribe to this blog, enter your info for a comment and check the last box to notify of new posts by email. Please share the blog link with other model railroaders. Enjoyed the photos and write-up. Thanks for sharing. I think the second number on the end is a light weight. Notice all end in 00, or 0 where only one digit is visible. On 749097, the side lettering is weathered and hard to read but the ltwt seems to be 37800 matching the lower end number. Always a pleasure to read your posts. You wrote”This car could be one of the Pennsylvania Railroad’s (PRR) H21 class hoppers. The car design was introduced in 1909 as a coke hauler but by the 1921 photo date many were hauling coal”. Note that the car under discussion has arch-bar trucks. The H21 class was originally equipped with arch-bars when used for coke. 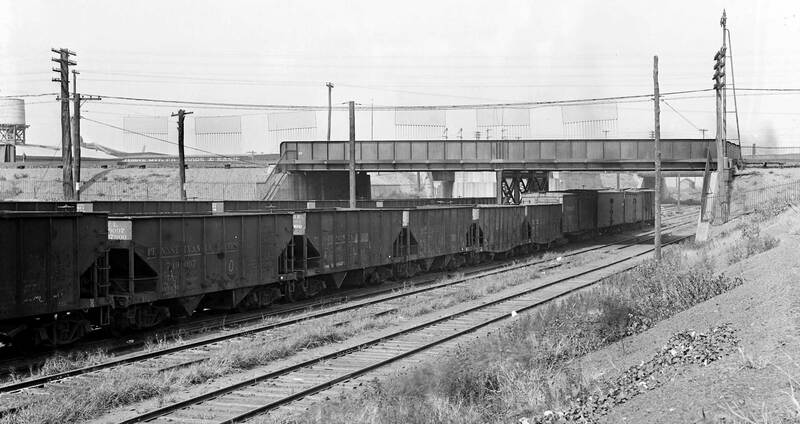 When they started hauling coal, the top chord reinforcing angle came along to prevent the sides from bulging. I was always under the impression that the trucks were upgraded at the same time to 70-ton Crown trucks. Apparently, this was not always the case, as shown by this photo. This is the first time I see such a car still equipped with arch-bar trucks.